The trade truce between the U.S. and China delays their economic battle but creates little hope for lasting resolution of the deep divide between the two nations on the future of the global economy, according to many China analysts. President Donald Trump and China hawks in his administration have frequently criticized prior U.S. presidents for being out-maneuvered and out-smarted by China’s tactic of engaging in endless negotiations and holding out the promise of reform while continuing to carry out its economic predation. The Obama administration spent years in what was known as the Strategic and Economic Dialogue without anything of substance to show for it. To critics of the Buenos Aires truce, the Trump administration appears to be repeating this mistake. “The president has fallen into the same trap as Barack Obama, George W. Bush and even Bill Clinton. He will get more platitudes and promises and very few results,” University of Maryland economist Peter Morici told the Wall Street Journal. One former administration official described the deal as “a total disaster. “We’ve now entered into the Trump version of the Strategic and Economic Dialogue,” the person said. Some conservative China critics say that the deal could have been worse. For weeks leading up to the dinner, many feared the U.S. would agree to end or suspend the 10 percent tariffs. From that perspective, the worst case scenario was avoided because the Trump administration only agreed to a pause in escalation. 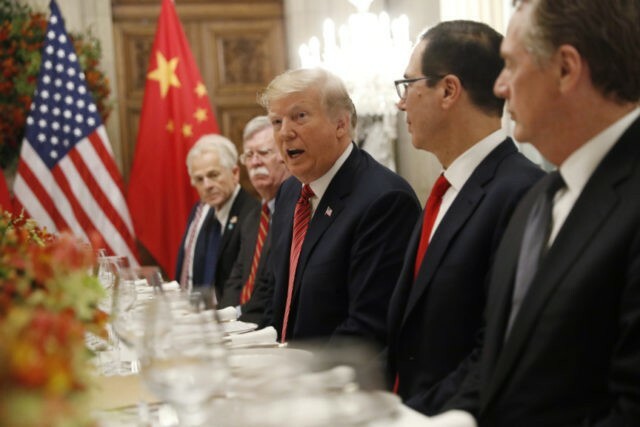 Not all analysts were as negative about the deal but few believe the U.S. and China were close to resolving their fundamental differences, in large part because China’s global ambitions would be thwarted by a deal that did resolve them. China and the US aren’t fighting over what China exports now — assembled electronics, toys, socks, furniture. They’re fighting over what China wants to make at home in the future. China has a plan to become self sufficient in electric cars, aerospace, bio-medicine and farming equipment. These things are hard to make. They require decades to figure out, and a well-educated, productive, high-wage workforce. Xi Jinping didn’t compromise on this goal in Argentina. It’s hard to see that he ever will. Less than 24 hours after the deal was struck over a dinner capping the Group of 20 meeting in Buenos Aires, Argentina, cracks in the truce consensus were already apparent. The U.S. agreed not to raise the tariff on $200 billion of Chinese goods from 10 percent to 25 percent in January, as had been earlier announced, while the two sides renew trade negotiations. But China and the U.S. are already taking very different approaches to describing what was agreed. According to the White House, the Buenos Aires truce is on a 90-day time line, after which the 10 percent tariff will rise to 25 percent. During that time, the two sides would address China’s forced technology transfer policies and intellectual property theft, the two items at the core of the U.S. complaint about China’s predatory economic practices. The White House also said that China would purchase a “very substantial” amount of farm, energy, and industrial goods in order to reduce its trade surplus with the U.S. The U.S. made no mention of removing the existing 10 percent tariff. China’s statements on the agreement, however, made no mention of a 90-day timeline or the possibility of tariffs rising if the deadline passed without progress. In a press briefing, Chinese officials said only that the talks would focus on removing the 10 percent tariffs and Chinese retaliatory tariffs. Chinese officials were also vague about what it might purchase from the U.S. as part of the deal. China’s statement also said that Trump would visit China and Xi the U.S. The U.S. statement made no mention of bilateral visits by heads of state. Similarly, the official Chinese news agency said the U.S. would continue to welcome Chinese university students while the U.S. statement made no mention of the topic. This creates the possibility that there is less to the agreement than it seems. Or even that U.S. officials have heard in Chinese statements what they hoped to hear but not what China actually intended. The U.S. has a long history of misinterpreting the statements and intentions. During the Korean War, for example, China believed it had clearly signaled that it would have to intervene militarily if U.S. troops got too close to the Chinese border. Officials from the U.S., however, misinterpreted this signal, leading to armed conflict between the two countries that was only ended by the 1953 armistice. “Neither side got their maximum demands and it’s not the first time in U.S.-China relations that both sides claim victory,” said Michael Pillsbury, a senior fellow at the Hudson Institute and a defense official under presidents including Ronald Reagan and George W. Bush, Bloomberg News reported. Even within the Trump administration, there is skepticism. Some administration officials have shied away from even describing it as a “deal,” preferring to call it an “announcement,” the Wall Street Journal reported. Some worry that Wall Street’s reaction to the announcement of the truce, which is seen as likely to boost stocks, will encourage the president to soften his stance even further. And it remains to be seen who will lead the talks that are supposed to follow the Buenos Aires truce. Recent trade talks with Canada, Mexico, and the European Union have been led by U.S. Trade Representative Robert Lighthizer, known as a hawk on China. But the talks prior to the Buenos Aires dinner were led by a group headed by Treasury undersecretary David Malpass. It is not yet clear whether the Treasury group will retain its lead role or whether Lighthizer’s office will take over. China imports US products that are hard to make and require skilled workers and years of capital investment: airplanes, cars and industrial machines. It also imports commodities: soyabeans, crude oil, plastic materials. In Buenos Aires, according to the White House, Xi Jinping agreed to increase imports only of commodities. These are the imports that China doesn’t care about, the imports that don’t threaten its plans. The concession costs Xi nothing. President Trump’s decision to delay tariff hikes or new tariffs on China for 90 days in return for more Chinese imports from America and further talks on core trade barrier and tech issues only delays what should be the inevitable. Since even the most detailed Chinese promises can’t be verified reliably, and since fostering bilateral economic ties has backfired so thoroughly on the US, any President determined to promote US interests will need to seek maximum economic disengagement from China ASAP. In China, the deal is being heralded as a triumph. Notably, the state-controlled Global Times tabloid emphasized that the deal essentially puts the U.S. and China on an equal footing. “As two major countries with great influence, China and the United States shoulder important responsibilities in promoting world peace and prosperity, Xi told Trump,” the Global Times reported. Trump said that he agrees with Xi on his evaluation of US-China relations. US-China relations are very special and important, Trump said, adding that it is in the interest of the two countries as well as the world that the United States and China, both countries of significant influence, maintain a good cooperative relationship. That’s very different from Trump’s own view of the Buenos Aires truce, which he described as “an incredible deal.” The president described the deal mostly in terms of concessions from China. “China will be opening up. China will be getting rid of tariffs,” he said before boarding Air Force One to return to the U.S.
Xi’s statement about “two major countries with great influence” may have special meaning for a Chinese audience familiar with the works of Confucius, one that does not bode well for the notion of future cooperation between the U.S. and China. “There cannot two suns in the sky, nor two emperors on earth,” Confucius said, according to the Chinese philosopher Mencius.